This queer rendition, largely dominated by folk elements, much in the fashion of a fairy tale, represents contrarily a very serious kind of myth, which various Puranas assert in great unanimity. It depicts Kalki, the tenth incarnation of Vishnu, that is, the last of his Dasavatara yet to take place. Some theologians believe that Kalki has already incarnated, but the version sounds to be wrong. With the incarnation of Kalki the present Kaliyuga would end. The age of the Kaliyuga, as estimated in the Mahabharata and other texts, is 4,32,000 years of which barely 5000 years have so far passed. Thus, this tenth incarnation is yet far off. The concept of the incarnation of Kalki is a pure Vaishnavite assertion of Manu's social order of four varnas and a revival of Brahmanism, something which majority of Indians may not now approve. 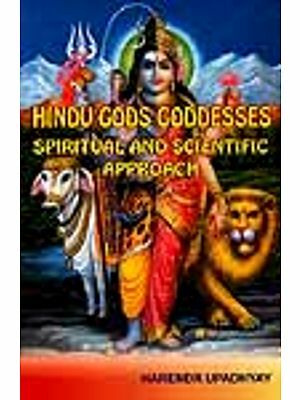 The Mahabharata Vana Parva, Agni Purana, Padma Purana, Brahma Purana, Brahmavaivarta Purana, Harivansha Purana, Brahmanda Purana, Bhagavata Purana, Vishnudarmottara Purana and several other ancient Brahmanical texts come out with brief but unanimous details of Kalki, comprising the tenth or the eleventh incarnation of Vishnu. Kalki is by and large a prediction, however, quite clear in its vision and in its fictional elaboration. Acclaimedly, towards the end of Kaliyuga, when righteousness turns into unrighteousness, light into darkness, good into evil, virtues into vices, believers into non-believing profanes, community of man into thieves and evil doers and the faith in God is lost and the Vedas are misinterpreted to serve adharma, Kalki would be born in the house of Vishnuyashas, a Brahmin and the priest of Yajnavalkya, at the village Shambhala. Some texts seem to suggest that Kalki would be born to Vishnuyashas as his son but the others claim that Kalki would be only the other name of Vishnuyashas. This Brahmin, the Dharma manifest, would create arms and soldiers by his will and himself carry a long sword and destroy the wicked malechchh, the low-caste people responsible for adulterating Dharma and breaking social order. He would restore the social order comprising of four varnas, and the four ashramas and all rituals and religions canons. For the fulfillment of his errand gods would give him a horse capable of swift speed in the sky as well as on the earth. 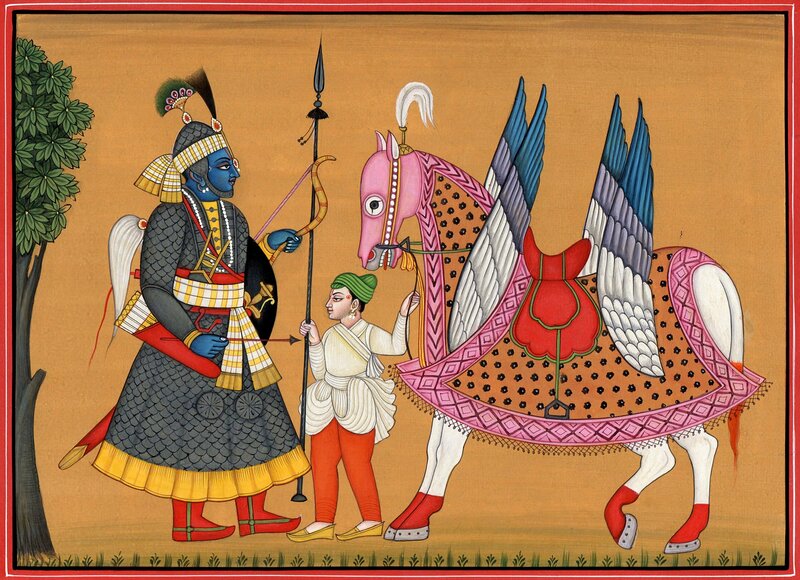 Given by devas, or gods, the horse would be known as Devadatta, or the one given by gods. The artist has largely adhered to this same Puranic elaboration. For delineating him as the last of the Dasavatara the artist has packed in his figure several features of Vishnu's previous incarnations. He has the same body complexion as Vishnu but a different body build, more like a mighty wrestler, such as only Balarama, amongst his incarnations, had. He is wearing a warrior like helmet but with peacock crest of Krishna crowning it. He has on his waist the long sword, as Puranas prescribe with his figure, but in his hands he is holding a bow and arrow, the characteristic attributes of Rama. As compared to his projected role in the fable, he has a shorter stature, something close to Vishnu's Vamanavatara. The armour, which he is putting on, has a fish like look with some sort of resemblance to his Matsyavatara. A well clad and bejeweled deva, with a Vaishnavite tilaka on his forehead and hence of the Vaishnava line, has brought him the horse Devadatta. With both its forelegs folded like an army personnel, the horse seems to salute its new master. The horse obviously has an unearthly bearing and with its wings an unearthly look. Except a partially visible saptaparni tree, the background is plain in opaque golden tint. The wide brownish red border, red feet of horse, features of the two figures, typically folded sash on the waist of the Deva and formal character of the horse have striking resemblance with the medieval miniature art style of Raghogarh in Central India.